I know that many of you cringe regarding the aerification of greens. This is very much a necessary and crucial practice that promotes a much better putting surface throughout the course of a golfing season and a much healthier stand of turfgrass. During this process the golf course will be closed for the day on Tuesday, September 11th. The driving range and the practice facility will be open during this time. Thank you for allowing us the opportunity to focus solely on this operation during this day to expedite the aerification process. We will have the front nine open for play on Wednesday, September 12th and the entire golf course (weather permitting) will be open on Thursday, September 13th. The aerification process will start by pulling a 5/8 inch core approximately 4 inches long in a 1.5 X 1.5 inch grid pattern over the entire putting surface and collar. It might look like a large amount of material that we are extracting from the greens but in reality we are only taking out 5 - 6% of the surface. After the cores have been pulled we will sweep and shovel the cores off the surface leaving a clean surface for us to apply our amendments, fertilizer, seed, and sand. This phase is the most time consuming, but is very much the most important aspect of core aeration. First we will apply humates, which feeds the micro-organisms living in the soil profile that eat organic matter (this is a good thing). Next we will apply gypsum which is a soil amendment which will help open pore space and combat against our effluent water, which is high in sodium and bi-carbonates (a bad thing). Then we will apply a heavy layer of USGA approved topdressing sand to fill all the holes and smooth out the putting surface. This sand is very clean and has very little organic matter content. Our greens at Meridian have a very high level of organic matter and there is such a thing as too much, which is what we have! Think of it as a cleanse for our greens, out with the dirty stuff and in with the clean fresh stuff. Once the sand has been applied we will over seed the greens with T-1 bentgrass seed. This variety of bentgrass is a very aggressive grass and creates a wonderful putting surface. It is very aggressive against the invasion of Poa Annua (Annual Bluegrass, a bad thing), which are greens are roughly 50% Poa. Once the seed is down we will drag the sand & seed to fill the holes until the surface is consistently smooth and all the holes are filled. Now comes the fertility and the greens will get the royal treatment. Mono-Ammonium Phosphate will be applied (promotes seed germination and better root establishment), K- Mag (good for immune system, traffic tolerance, and drought resistance). Finally, Ammonium Sulfate is applied, which is loaded with Nitrogen that the plant loves (its main food source) and it is very acidic which combats against our high pH water and soil. 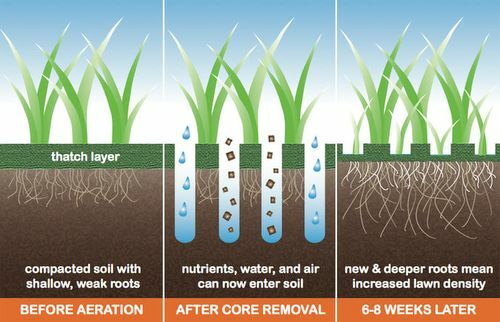 When it is all said and done the core aeration process has many benefits including thatch removal, compaction alleviation, improved respiration (air circulation), and a much healthier stand of finely maintained turfgrass. As previously stated, greens aerification will take place on September 11th, 12th, and 13th, 2018. The entire course will be closed on Tuesday, Sept. 11th, and the back nine will be closed on Wednesday Sept. 12th. All material ©2014 FlexScape, LLC. All Rights Reserved.